Our detectors are track-etch open device using Kodak LR115 film & provide extremely accurate results. It has a hinged holder mechanism enabling it to be open or closed. There are many features unique to the Volalpha radon detector: It is compact in size measuring only 40mm x 53 mm x 2.5mm thick; this is small and discreet meaning they can be placed out of sight. The detectors are packed in convenient boxes of ten, easily affixed by the self-adhesive pad on the reverse. 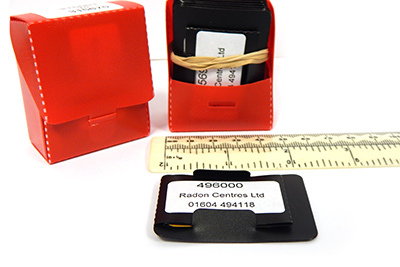 The opening and closing feature enables this detector to be used for personal dosimetry, essential if staff maybe exposed radon areas. The film sensitivity & sophisticated software used in the laboratory provide accurate results. Our detectors are competitively priced, only reads radon particles whilst open & has a 12 month shelf life (storage conditions apply).